This attractive postwar German bicycle was restored just before I bought it five years ago. It is ready to ride. It’s fully accessorised, including a Durkopp bell. In Bielefeld, Germany, during the middle of the 19th century, the industrial revolution had turned the city into a major textiles location. Imported sewing machines, mainly from the USA, were used to further process the materials. They were expensive to buy and hard to service. Two mechanics, Baer and Koch, recognized the opportunity and started the first sewing machine factory in Bielefeld . The success of the venture indicated to the partners the potential of the new market, and in 1865, Baer decided to start his own operation. Koch continued trading under the name of Koch & Co, and by this time, he employed two sewing machine mechanics: Dürkopp and Schmidt. Dürkopp had already designed his first sewing machine in 1861, and in 1867 together with Schmidt, he started his own company known as Dürkopp & Schmidt. Within the following 20 years, Bielefeld developed to become one of the most important centres of the sewing machine industry in Germany. In 1880, there were 19 Bielefeld companies operating in the sector. Their products enjoyed international recognition and were sold all over Europe. The sector underwent a crisis in the 1880s as a result of growing national and international competition. 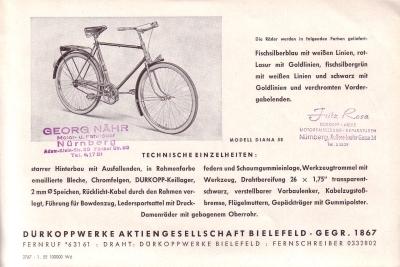 Dürkopp & Co, as the company was called after Schmidt’s departure, was the first enterprise to start seeking new markets with the manufacturing of bicycles. The new product line sold very well and the company continued on its successful path. 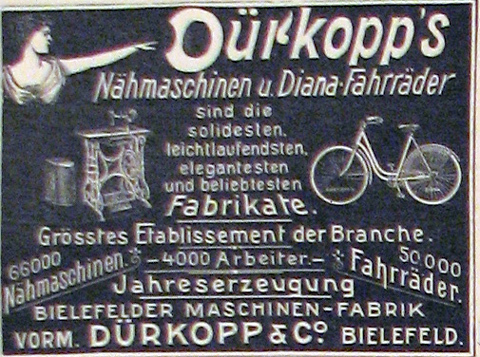 As did other companies, Koch & Co. followed Dürkopp’s example, and bicycle manufacturing soon became an important factor in the town’s economy. Inspired by his success, Dürkopp started manufacturing cars, trucks and other forms of motorized transport at around the end of the century. While Dürkopp was constantly busy trying to find new fields of business for his company, Koch & Co. concentrated on industrial sewing and clothing equipment. Its brand name “Adler” became synonymous for special sewing machines of international demand. 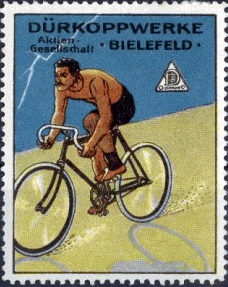 Kochs Adler Nähmaschinenwerke AG, as the company was called by then, therefore discontinued bicycle production in 1920. At the end of the 1920s, the world economic crisis forced Dürkoppwerke AG, the name of the company after the death of its founding father, to give up car production, which in any case had not been a great success. 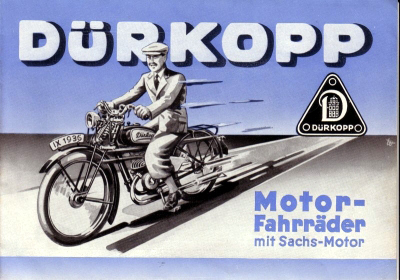 Like most other German manufacturers in the 1930′s, Durkopp marketed lightweight motorcycles with Fichtel & Sachs engines (above). After the Second World War, Kochs Adler Nähmaschinenwerke also attempted new fields of business with the manufacturing of typewriters and packing machinery. For a short period of time , both divisions were dropped, and so was the production of household sewing machines. Since 1952, Dürkopp had manufactured parts for Ardie. In 1955 the Ardie factory, situated in Nuremberg, was incorporated in the Dürkopp trust. 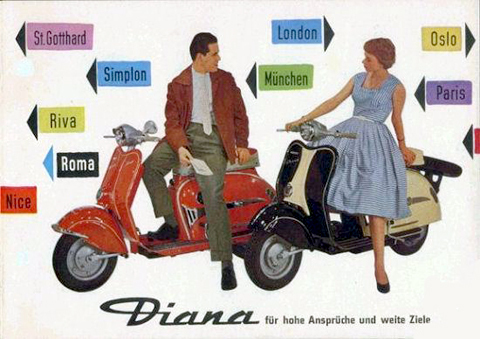 After the merging between Dürkopp and Ardie, a couple of mopeds were marketed, under both the Dürkopp and Ardie names. 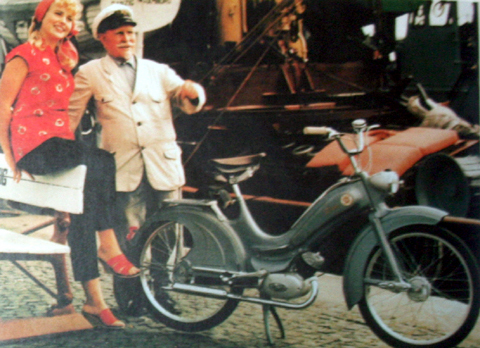 The first moped was the “Fratz I” model with a 50cc two stroke engine from Dürkopp. It preceded the “Fratz II”, Fratz III”, “Fratz IV” models and the “Dianette” model. (The Swedish one pictured below is from 1961). The Durkopp MD150 and MD200 motorcycle range appeared in 1951. A front-mounted ‘hilfsmotor’ (help-engine) was in production for a short time. 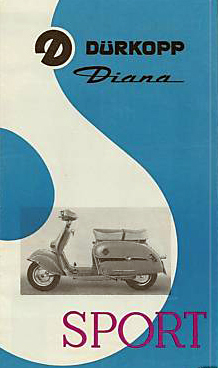 And the 200cc Diana scooter was produced from 1954. From the sixties, Dürkoppwerke AG specialized in industrial sewing machines and conveyor systems. In 1962, a majority of shares in Dürkoppwerke AG were acquired by FAG Kugelfischer. When the Kugelfischer group took over the majority of shares in Kochs Adler AG in 1987, the path was leveled for a merger of the two competing factories. From 1990 onwards, they have been operating in the new complex in Bielefeld, Oldentrup under the name of Dürkopp Adler AG. Today Dürkopp-Adler is a modern company with its main focus on the manufacturing of industrial sewing machines, high speed sewers, multi-needle-machines and winding machines. the company has worldwide supply and production sites in the Czech Republic. 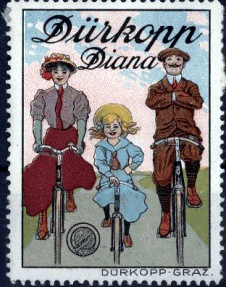 The Diana name had actually been used by Durkopp for their bicycle range at least since 1910.